Do you love Hello Kitty? If your answer is positive, here’s got a very good news for you. The developer has introduced its new Hello Kitty robot to commemorate Hello Kitty’s 30th anniversary. The cutie is also the latest addition to the Hello Kitty family. As you see in the photo, this pretty robotic cat is able to gesture by moving its head and arms. In addition, this robot also features face recognition technology to remember the faces and names through a stereo CMOS sensor camera and voice recognition microphone. The Hello Kitty robot will surely amaze its owner. 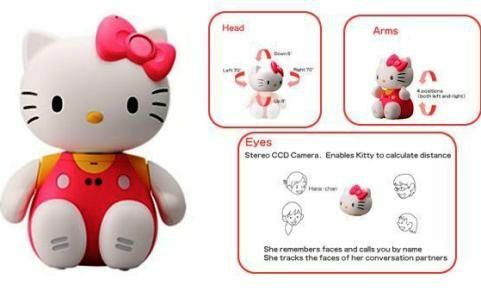 With lovely Hello Kitty’s voice, this robo toy can communicate with people in three different personality situations including as a close friend, with the family and as a guessing game. These useful and innovative features seem perfect for children who seldom stay with their parents. The new Hello Kitty robot which weights only 6.2 kg will available in coming November for $6,299.